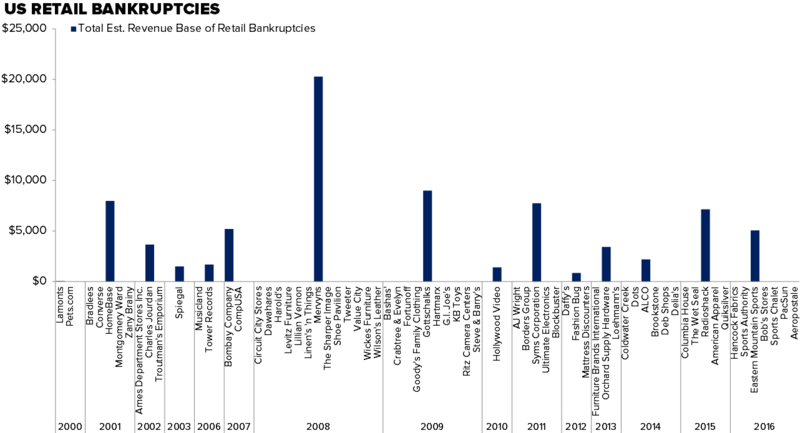 Takeaway: Retail bankruptcies highest since 2009. This UA/China knockoff that getting so much press is a right of passage. We're not worried bout it. First off, let this serve as a reminder as to how long these apparel retailers can sustain a state of sub-mediocrity without going under. While not super high margin businesses, the only real capital needs are in inventory -- as capex is generally low, and property values are almost all off-balance sheet. In other words, by the time a company looks like it is headed to file, it might actually have another full economic cycle left in it. That's Aeropostale. 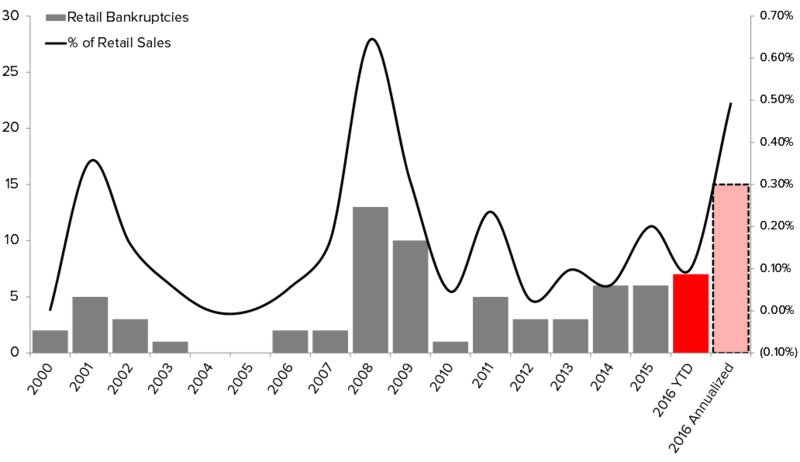 Secondly, this event marks the sixth major retail bankruptcy of the year -- putting the year-to-date count ahead of the full-year Ch 11 tally ahead of the full year count for each of the past six years. If we annualize the current run-rate, we'll be on track to see more bankruptcy events than any year in two generations -- including the Great Recession. In fairness, as someone astutely pointed out to us last month, Chapter 11 filings are historically weighted toward the start of the fiscal year. That, in fact, is true. But we're still likely to see a few more by the end of the year. Regardless of any nuances, the most notable point to us is that we're seeing such a significant uptick in business failures when we're so late in this economic cycle. The press is blowing out this whole 'Uncle Martian' debacle as being debilitating for UnderArmour in China. It's definitely serious. But every other brand has 'been there done that'. It's almost turned into a right of passage in this business for some lowly Chinese knock-off specialist to carbon copy intellectual property (Name, Logo, Likeness) for premium US and European brands. Just look at the juxtaposition of the pictures below. Our latest note on UA, titled UA | Huh? Can be found at the following link CLICK HERE. GIL - Gildan Activewear Announces Agreement to Acquire Alstyle Apparel, LLC, the Apparel Division of Ennis, Inc.